An investigation of bacteria and fungi taken from the space station reveals microorganisms similar to those found in busy public spaces on Earth. 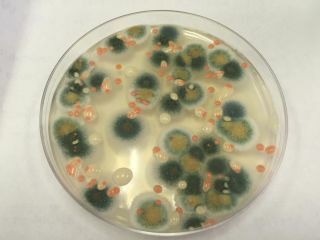 Just like on Earth, there is a robust population of bacteria and fungi on the International Space Station (ISS) — and a new study catalogues its exact composition. Most of the microbes are associated with humans, particularly the bacteria Staphylococcus (26% of total bacteria isolated), Pantoea (23%) and Bacillus (11%), according to a statement on the new work. Other organisms come from specific parts of humans, such as Staphylococcus aureus (10%), which is usually found in human nasal passages and skin. Another example is Enterobacter, whose percentage was not specified in the release, which is found in the human gastrointestinal tract. While it sounds like a gross combination, the scientists noted in the statement that similar bacteria are found in mundane Earth environments such as offices, gyms and hospitals, so the space station is similar to these other "built environments" frequented by humans. "Specific microbes in indoor spaces on Earth have been shown to impact human health, Kasthuri Venkateswaran, a senior research scientist at NASA's Jet Propulsion Laboratory and a co-author of the paper, said in the statement. "This is even more important for astronauts during spaceflight, as they have altered immunity and do not have access to the sophisticated medical interventions available on Earth." The researchers said this study is the first "comprehensive catalog" of the fungi and bacteria found on surfaces in a closed space system, such as the ISS. The researchers said this could lead to eventually developing safety measures for astronauts during spaceflights, although right now the risk to spaceflyers (if any) is unclear. Astronauts collected the samples during three flights spanning 14 months, a time span that allowed the researchers to see how the microbial and fungal populations changed over locations and during time. They came from eight locations on the ISS, including the dining table, toilet, exercise equipment, a viewing window and sleeping quarters. "The authors found that while fungal communities were stable, microbial communities were similar across locations but changed over time," researchers said in the statement. "Samples taken during the second flight mission had higher microbial diversity than samples collected during the first and third missions. The authors suggest that these temporal differences may be due to the different astronauts on board the ISS." The new research was led by Aleksandra Checinska Sielaff, who has affiliations at both NASA's Jet Propulsion Laboratory and Washington State University. The work was detailed April 8 in the journal Microbiome.